The 3rd anniversary of SmartBots arrives in February! 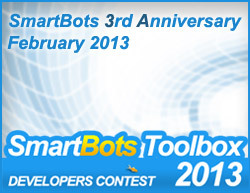 We are celebrating this date by running a contest for developers – SmartBots ToolBox 2013! All Second Life developers are welcome to participate in contest: create tools, devices or services which utilize SmartBots. This can be a tool designed especially for SmartBots, or device which uses SmartBots as addition. Business Booster – the most helpful idea for a SL business. The winner in each nomination will get prizes, all participants get special bonuses from SmartBots and contest sponsors! We welcome sponsors to join our efforts and help running the contest. In return, we provide special sponsors packages which helps promoting your Second Life business. See this page for more information on sponsorship. For more information: contest details, terms, rules – see special page in SmartBots documentation. Click here to learn more!